Like a bard from ancient times, my music shares the lyrics of life to enlighten us to remember more of who we are. It forges a path deep into our heart to fill it with love and blessings when we need it the most. Then uplifts us to dance the joy and celebration of Life. I invite you to take a musical spiritual journey with me, relax into your heart free of time and space, fly to far away places on the wings of angels, dance with the stars, listen to the whispers of your heart and receive blessings from the Divine to attune to the Love and Joy that resides within you. Music is one of the most powerful ways to get in touch with the creative essence of our soul. Whether we are creating music or listening to it, music opens us to the Divine to give that essence full expression, fostering a more joyful and expanded life. 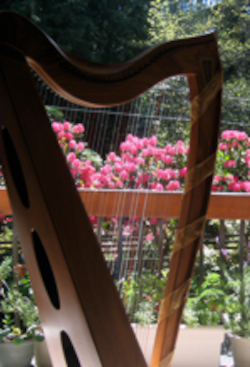 The magic of the harp quiets the incessant chatter to soothe the mind and uplift us through the difficult passages in life. It’s a mystic experience whenever a new song expresses through me with the perfect essence of the present moment. Over the years, my music has become a form of journaling my spiritual path to embrace a new and ever evolving life. Each song has opened my heart a little more until it’s overflowing with infinite Love and Joy. Thus, it gives me great joy to compose and sing the music that flows through me to open hearts to the magnificence lying dormant within each of us. My passion is to inspire you to move through life with an open heart, in touch with the magic bubbling up from within you. There is so much to celebrate as humanity is awakening to a more enlightened consciousness and I invite you to join me in embracing this new world.